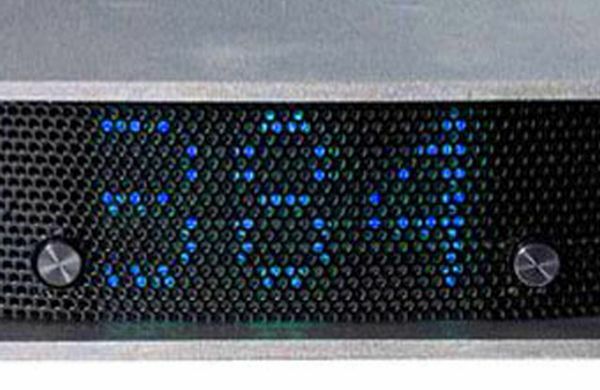 The red light indicates that the Hugo is receiving 16/44.1 data. 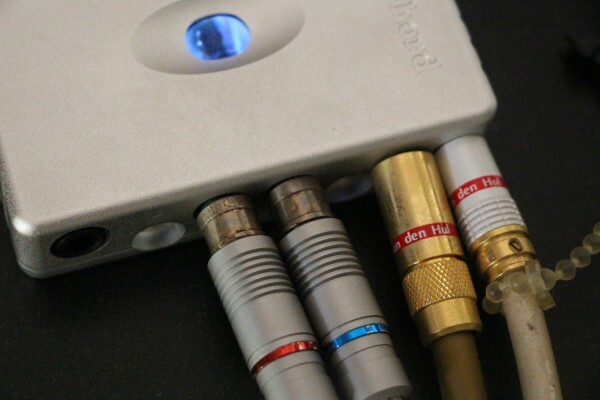 There are many audiophiles who are using Chord’s Hugo as a standalone DAC for their home rigs even though it is designed to be a mobile headphone amp/DAC/preamp. I am one of them. That many audiophiles consider the little gadget good enough for their home rig speaks volumes of the quality of the music that comes from Chord’s Hugo (named such because it is something you can take along ‘wherever you go’). In my case, I have not taken it anywhere and it is staying put in my home rig. There are many features in the Hugo, so I will talk about them one by one as best as I can. I can vouch that on a full charge, it can last about nine hours, depending on usage. Since it is battery powered, the noise floor is very low. Also, I could hear no distortion when I used the DAC with the charger plugged in. I used the resident Sennheiser HD600 headphones and a pair of Audio Technica ATH Pro5 Mk II. The Sennheiser was a better match with the Hugo than the cheaper Audio Technnica and it would appear the Hugo is a better match with higher-end headphones. The Hugo has a crossfeed feature for headphone listening which is supposed to enlarge the soundstage so that the impression of the singer singing somewhere in the middle of your head is erased. However, the effect seemed the opposite of what was claimed and the crossfeed feature seemed to make the soundstage smaller. I heard the crossfeed effects quite clearly with the Sennheiser but not so clearly with the Audio Technica. In the end, I used my headphones with the crossfeed off. The analogue output is very quiet since it is battery powered. 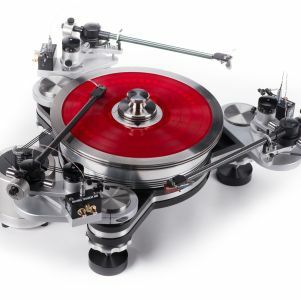 The sound quality is quite good – I found out from the boss of Chord Electronics John Franks when he was in Malaysia earlier this month that it is a Class A design. But a separate high-quality preamp like the Lamm LL2 Deluxe that I am using will often beat the preamp outputs of DACs and if you prefer the sound of your preamp, use it. There are some people who claim that using the preamp of any DAC is the best option, but I feel a high-quality standalone preamp will always be better. However, if you do not have a preamp, it will suffice to use Hugo’s preamp feature and plug it directly to your power amp. In fact, the Hugo can drive sensitive speakers directly. I actually found the preamp feature very useful when I compared digital music with analogue music as the output levels from the DAC and phono preamp were different. When you want to use the Hugo as a preamp you have to press a small switch to the left as you switch on the Hugo. 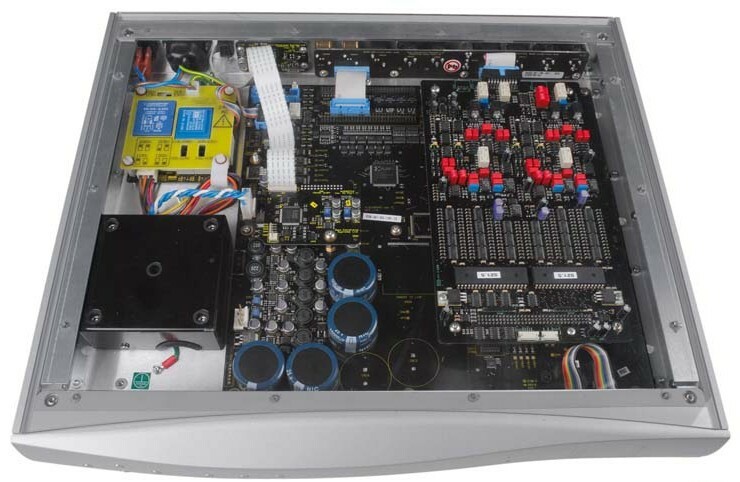 The volume control, which rolls like a wheel, will light up in white colour signifying that the output is set for preamp function. I soon discovered that the preamp feature worked at other output levels (in other words, the volume control is lit up in a different colour), so it was only a matter of turning the volume down to roughly match the loudness of music played from the vinyl on the turntable when I wanted to do an analogue vs digital comparison. 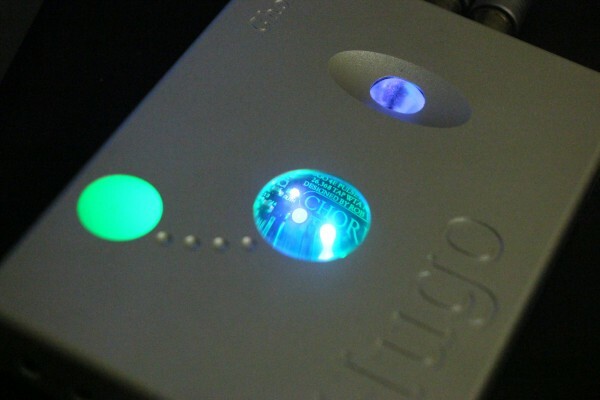 The Hugo is fantastic as a PCM DAC and I spent many hours rediscovering my CD collection. 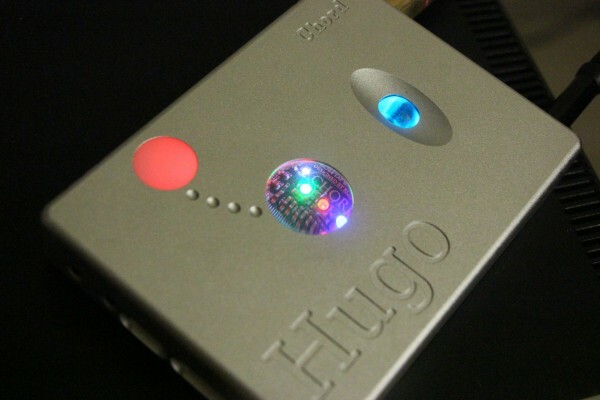 The Hugo DAC is very forgiving and even bad recordings sound acceptable while good recordings sound fabulous. It is probably due to the fact that Hugo does not use an off-the-shelf DAC chip but a Xilinx Field Programmable Gate Array (FPGA) semiconductor device with special filters created by the DAC’s designer Rob Watts. Rob voices the FPGA DAC by rewriting the algorithms. The sound stage is spacious – as spacious as the resident Wyred4Sound DAC2 – but with much denser images which makes the singers and musicians ‘solidify’ in space. There were also lots of details, but they were presented in a palatable way. Another unique feature is the layering of sound with the impression of the singer in front of the orchestra or the bassist slightly in front of the drummer. Since the Hugo could do the positioning of images well, I played lots of live recordings from Eric Clapton Unplugged to The Corrs Unplugged and Cowboy Junkies Trinity Sessions Revisited and these were most enjoyable. Since the Hugo is battery-powered – as mentioned earlier – it has a very low noise level and I was taken by surprise when I played a Simon & Garfunkel CD and heard someone saying softly: “One, two, three, four…” before the song started. Due to the low noise floor, lots of little musical details emerge from the mix, even from familiar songs. 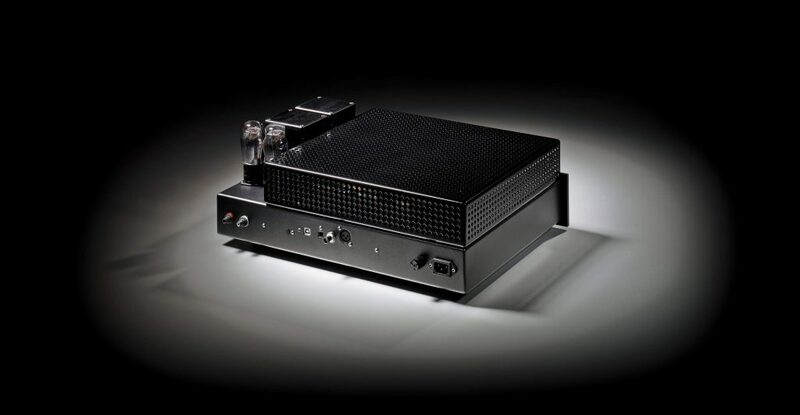 As a PCM DAC that decodes up to 384kHz files, the Hugo is among the best in the market and can hold its own against some of the high-end brands that cost 10 to 15 times more. The colour of the round window on the left side of the front panel changes with the sampling rate of the music file. And you can see its circuit and FPGA device through the transparent window in the centre. This where I have a beef with the Chord Hugo. I read it online and I confirmed with John Franks that the Hugo actually decimates any DSD file – 2.8 or 5.6 – into PCM 352.8 for processing. So Hugo does not decode DSD files natively. I found out about this when I used my laptop with J River V19 to convert ripped CD files (16/44.1 PCM) on-the-fly to DSD 5.6 and fed them to the Hugo only to hear a loud hiss. The hiss was so loud that I feared for the tweeters of the ATC speakers (thankfully they were not damaged). I was disappointed that the Hugo could not decode DSD natively and I had to change the command to send ‘2XDSD on DoP format’. 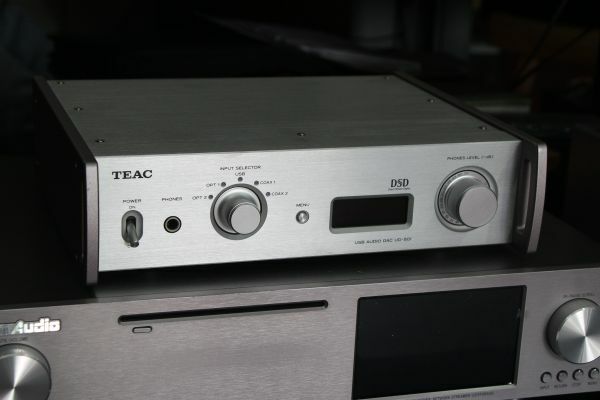 I had no problems sending ‘2XDSD in native format’ to the TEAC UD-501 DSD DAC and the Denon DA-300USB DAC, which I had reviewed earlier and are cheaper than the Chord Hugo, BTW. I read online that the designer Rob had decided to decimate the DSD files to 352.8 PCM because he felt it was a better way to handle DSD files – given their inherent high noise levels – and he had heard no difference between DSD decimated to hi-res PCM and DSD decoded natively. However, as a consumer and reviewer I feel that the user should be given the choice of selecting the mode of decoding. There are various scenarios – I have CD rips (16/44.1 PCM) and I want to play them as 16/44.1 PCM or I want to play them converted on-the-fly into 2XDSD so that I can hear the supposed sonic advantages of DSD. Or I want to play native DSD files (like what I have in my hard disk from Opus in 2.8 and 5.6 converted from analogue tape masters) and I want to hear the supposed sonic advantages of DSD. Unfortunately, the Chord Hugo does not allow me to do that and that is my only complaint – well, there are other complaints but more on them later – about the Hugo which otherwise is a great-sounding and relatively affordable DAC which sounds more expensive than its price tag. The inputs and outputs are placed too close to each other. This cannot be helped as the Hugo is designed to be mobile and fit into a large pocket. Remember it is also a headphone amp for those on the go. My Van den Hul and QED Toslink cables and Van den Hul co-ax cables cannot fit into the sockets. This was a major problem with the first batch of the Hugo and the later batches came with bigger holes for the sockets, but cables with large connectors still cannot fit into them. What Chord has done is to supply a range of co-ax, USB to micro-USB and Toslink cables with the Hugo. That’s good news for most of us. It’s a tight and loose fit with the Chord Hugo. It’s tight because there is little space between the connectors and it’s loose because the co-ax and Toslink cables cannot fit in properly. I had to use the Toslink cable supplied by Chord and the co-ax with an adapter, also supplied by Chord. The control switches are too small and I have been forced to use the fingernail of my pinky to turn things on and off. According to John Franks, this was done on purpose so that the Hugo would not be switched on or off accidentally when the user is on the go. When powered on again, the source does not return to the previous used source and you have to press a tiny button with your fingernail to choose the preferred source. Despite all the quirks and my beef with the way it handles DSD files, the Hugo is a true audiophile bargain. For relatively little money, you get to climb to the higher levels of the stairway to sonic heaven. The Chord Hugo is now my reference DAC. 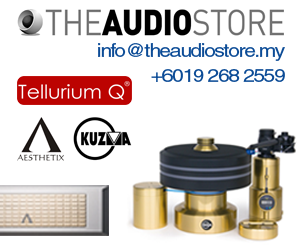 Chord Hugo and other Chord components are available at Centre Circle, Taman Tun Dr Ismail, Kuala Lumpur.